Home » Activity » Closed! I just closed a property in an area I never expected to work: South Central Los Angeles. I have fearless buyers who are focused on the bottom line, and the bottom line pointed them very far south of the 10 freeway. 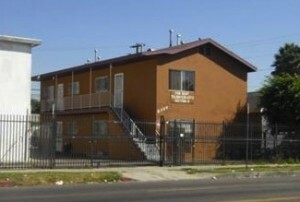 We closed 8306 S. Main St. at $395,000 with rents at $4,120 per month. That’s a GRM of 7.99! You can’t find that in Echo Park, Highland Park, or even Boyle Heights. What are the trade-offs here? The plus is you have excellent income with nice tenants. Three out of four tenants have Section 8 help, so the government cuts you a good paycheck every month and stays on top of them. We paid all cash and my clients stand to make 9.6% on their investment per year. If they refinance they’ll make over 17.5% on their cash per year. The negative is that it’s not a high-growth neighborhood and there’s more crime. However, that doesn’t mean there won’t be appreciation. The previous owners bought the property for $250K in 2010 and just saw a 63% return in two years. That’s not bad. What’s the lesson here? Do what you’re comfortable with. But if your true focus is the bottom line, a good investment is a good investment.